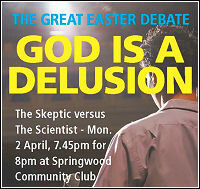 On Monday, April 2, I took part in a debate at the Springwood Winmalee Anglican Church on the topic "God is a Delusion". It seemed to go very well, and I escaped without any bodily damage, although I was assailed by a couple of religious fanatics afterwards, one of whom seemed sure that I was bound straight for Hell. (The other one kept repeating some weird and incomprehensible theory about how the Bible should be read. I managed to escape but I later found her talking to my opponent in the debate. He was trapped in a position where he couldn't get away and was making "Help me" type body language signs to anyone who passed by.) As I spoke without any prepared notes I want to wait until I have seen a recording of the event before writing anything about what I said. I was approached by a journalist working for the Sydney Diocese news service with some questions after the event. My responses were written from the perspective of Vice President of Australian Skeptics, but I wouldn't say what I said unless it was also my position. 1. Why is the skeptics society interested in getting involved with debating Christians about the existence of God? We are often accused at Australian Skeptics of being an atheist organisation which is hostile to religion in general. In fact we follow our motto, "Seek the evidence", with respect to religion in the same way that we treat other claims of the paranormal or supernatural. We have no problem with religion as long as the beliefs and practices of religion cause no harm, so we usually only take an interest when faith healers start telling people to throw away their wheelchairs and insulin or young-earth creationists try to get religion taught as science in schools. We do not ask for people's religious affiliations when they subscribe to our magazine or attend our events. We don't need to know and we don't care anyway. We do know that there are believers among our membership, because some have chosen to tell us, and there is at least one ordained minister who regularly attends events in Sydney. We are interested in debates like this because it exposes both sides to the other. This goes a long way to removing prejudice (in its literal meaning of "pre-judging") and demonstrating that we are all just people with opinions and beliefs, these opinions and beliefs can differ, and that these differences can be discussed in a civilised and polite manner. 2. What are the main arguments you used in supporting that 'God is a delusion'? I don't really like the word "delusion" because it has a specific meaning in psychology, but we were stuck with it for this debate because of the prominence of Richard Dawkins' book, The God Delusion. As a delusion is a belief without evidence, my point in the debate is that faith is also belief without evidence. The true skeptic position is that God is unknowable and untestable, so God is therefore a form of delusion. This is not necessarily a bad thing, because that is the nature of God, but we feel entitled to ask for evidence of God's existence. Please note that this is a weaker position than that taken by Dawkins who has attempted to prove that God cannot exist. I agreed with the opposing speaker that Dawkins did not succeed. This question requires an essay of its own. I can only speak for myself because the skeptical movement is one of those broad churches that people talk about, but my belief is that we don't know how life arose (but it was probably due to a coincidence of fortuitous circumstances), we have got to where we are today by a process of evolution, and our purpose is to take advantage of the world we live in and to live the best possible life that we can while still respecting the rights of other people, the earth's environment and the abundance of organisms in the natural world. 4. What is your hoped for outcome when debating Christians in debates such as this? I don't expect to convert anyone to atheism and I don't expect to experience an epiphany myself, although as a true skeptic I am prepared to be proved wrong on either count. What I hope for is that everyone can go away with a better understanding of why the other side holds the position it does. We can only benefit from knowing more about what others think. As I said above, we are often accused of being radical atheists. Hopefully the religious believers will leave the meeting with the impression that skeptics are just people who sincerely hold a different opinion about the existence of God, and the skeptics will go away with the impression that religious believers are the same but the opinion about God is different. Both groups will probably continue to think that the others are deluded. Jack Shulman was not happy with my response to his last effusion. Here is the latest instalment. Someone wants me to do something ridiculous. I don't think I'll bother. You can see why Dr Haley is of interest here. What can I say in the face of such Wildean wit? I have noticed that just about the only hostility I ever receive about my stance on this site against religious bigotry, extremism or excess seems to come from followers of Hillsong or Benny Hinn. Perhaps followers of real religions are more tolerant. There was no update to this site last week for two reasons. The first was a simple oversight followed by a bureaucratic implosion. Because I have had other things on my mind I forgot to pay my monthly bill for web hosting. At about 10am on Thursday, April 12, the hosting company sent me a reminder email. I was out of the office, and by the time I got back after lunch three of my sites were off the air and no email was getting to me through the usual addresses. I logged in to the customer service page (which told me "You have services pending deactivation due to 3 unpaid invoices", giving a whole new meaning and retrospectivity to the word "pending"), and by 2:45 all the bills had been paid by direct deposit into the company's bank account and the required evidence of the deposits had been submitted in the required fashion. Then the fun started. Trying to get reconnected, I became involved in an exchange of emails and telephone calls which made me feel that I had fallen down a rabbit hole or passed through a looking-glass. My sites were back on the air (and my email restored) at about 9:30 on Monday morning, but what's more than 90 hours when you're talking customer service and satisfaction? I mentioned that there were two reasons for being missing in action over the week. A clue about the second reason can be found here. I have just finished reading by Ayaan Hirsi Ali. I might write a full review one day, but this is a book which elicits both despair and hope. Despair that primitive savagery inspired by religion is still part of the lives of many millions of people, hope that resistance, exposure and enlightenment might loosen the foundation of fundamentalism (in this case Islam, but the problem is not confined to that particular delusion). I found parts of the book quite disturbing, such as those referring to the mistreatment of children by abuses like the genital mutilation of girls, the descriptions of the way that Hirsi Ali had to live in fear after the murder of her friend Theo van Gogh and the breakdown of the relationship with her father, but the very fact that the book is out there is encouraging. I wish I could think that it might be causing Muslims to re-examine what they are told and are expected to believe. I am not that much of an optimist, but I can always dream. Ayaan Hirsi Ali will be in my town for the Sydney Writers' Festival in May and June. I'm not usually awed by celebrities, but she might just be one person whose signature I would like on a book. I think I know where I will be on the evening of June 3. Within twenty-four hours of the murders at Virginia Tech, the inmates of various wards of the asylum were rushing to their keyboards and media contacts to tell us why it happened and how it could have been prevented. There are no prizes for guessing that the gun nuts were almost immediately declaring that the way to stop mass murder is to have everybody heavily armed so that everyone can participate in pitched gun battles at any time. Apparently, fewer people would die in incidents like this if there were orders of magnitude more bullets being thrown in all directions by untrained and unskilled shooters blazing away in the approximate direction of where they thought some threat might be. The religious nutters didn't want to be left out, and there were claims that all the people died because the shooter likened himself to Jesus, although why God required the sacrifice of thirty-two innocents to atone for one lunatic's blasphemy must be one of those mysterious ways in which He moves. Not to be outdone, alternative medicine supporters were very quick to blame the incident on anti-depressant drugs. It seems that if you are the sort of nutcase who thinks he is Jesus and wants to kill lots of people to make your point clear you will restrain yourself until you receive medication, at which time you will stop being depressed, cheer up and start shooting. The chelation quacks were claiming (without any evidence, of course) that the killer was autistic and could have been cured if only his parents had spent their life savings on useless treatments. Certain brain activities trigger people on Prozac to become homicidal or suicidal. Thanks to research by Illuminati controlled companies, the Network knows exactly how to used ELF waves vectored on a particular person by 3 separate towers to stimulate the Prozac controlled brain to murder. This is being used to increase acts of anarchy and violence in order to help insure anti-gun legislation. If a slave doesn't comply or needs to be thrown from the Freedom Train they can become a useable statistic. Simply trigger them to murder and then watch the police gun them down. The NWO gains one more statistic and another case to scare the public into accepting gun control. We have become accustomed to seeing crowds of apparent lunatics burning effigies of politicians because of some perceived insult to nationality or religion. The stereotypical effigy-burner is a Muslim fanatic complaining about some offence against Allah that President Bush has done, or might have done, or might have once thought of doing, or might have never thought about but had been in the same city as someone else who had thought of doing it, ... It was somehow refreshing, therefore, to see images of Hindu fanatics going berserk and burning effigies of an actor. The actor in question was Richard Gere, and the reason for the angst and anguish was that he had kissed a woman. Apparently, this was an affront to religious sensibilities and Indian women in general, and was made even badder by reminding people that there might be some sort of sexual connection between men and women. My memory might not be what it was, but I seem to remember that there is a country which produced a manual of sexual practices called the Karma Sutra and which is so committed to women's rights that it can't seem to eradicate men killing their wives over inadequate dowries or the practice of widows committing suicide on their husbands' funeral pyres. Idiocy. The Easter Debate was written up in the local Anglican media, although the article seems to be about some other debate with participants with the same names. I wasn't there to concentrate on Richard Dawkins' book and as far as I can remember I didn't, although I have now received the first cut of the DVD so I probably should check my memory of the event. So far the article only appears on the web, but I assume that it will be immortalised in print in next month's edition of Southern Cross, the newspaper of the Sydney Diocese. Anyone who deals with the media on a regular basis will be familiar with the misquoting and partial quoting which makes the lives of people like me somewhat frustrating at times. In one sense it was comforting to find that the comment editing practices of television "current affairs" programs are alive and well in the religious media as well. Still, I suppose that being slightly misquoted is better than not being quoted at all. You can see the article here. Guess who else crawled out of the swamp this week with complaints about this web site. I know it was an easy guess for many but there might be some newcomers here who are not familiar with the work of Mr William P O'Neill of the Canadian Cancer Research Group, the man who suggested that someone should kill my grandson. Taking time out from lying to television reporters and writing bizarrely unhinged attacks on Canadian doctors, Mr O'Neill found the time to complain once more to the organisation hosting The Millenium Project. He got the same response as last time, which is that they told him to lawyer up or shut up. The really nice thing is that I was invited to write a more comprehensive reply which would be passed on to Mr O'Neill by the web hosting company. A couple of years back I was made a similar offer by the CEO of a business organisation who suggested that I could write his reply to Mr O'Neill's allegations, but then, as now, I maintained my policy of not responding to Mr O'Neill except through the pages of this site. Mr O'Neill is quite capable of amusing us all without me feeding him straight lines. For the past number of years I have made specific complaints to Destra.com concerning your client at https://www.ratbags.com/roles and the site owner, Mr. Peter Bowditch of Parramatta, NSW, Australia. The nature of my complaint has been libel, defamation, fraud, misrepresentation and most recently formal complaint under Australia's Trade Practices Act 1974, Section 52 as it concerns myself, William P. O'Neill and my medical practice, the Canadian Cancer Research Group. In this complaint Bowditch and Destra are named as respondents in willful and reckless, deceptive and misleading advertising concerning myself and my group. The significance and magnitude of this complaint has attracted mutli-media interests in Australia, the United States and Canada. I am writing to reassure Destra.com that I will portray your group's participation in this matter as it it unfolds. Historically your group has actively supported the actions of Mr. Bowditch in view of the facts both Bowditch and Destra.com have co-broadcasted information that is knowingly false, deceptive and misleading. Be further reassured, that your investors will be fully aware of your patently absent sense of ethics and continued breach of your own AUP. In the event the website in question is no longer hosted by Destra.com/Ozhosting.com or any affiliated ISP group, by the close of business of business on Friday, April 27, 2007, I will exclude Destra.com/OzHosting.com in all matters of complaints, action and media. Be advised this communication is private and that international convention requires consent by the authour for publication and distribution. I would love to see evidence of the way that "mutli-media" interests in Australia, the United States and Canada have been dealing with the significance and magnitude of Mr O'Neill's perceived problems, but I won't hold my breath waiting. And as for the last paragraph mentioning some international convention, I can only refer Mr O'Neill to the clearly-stated policy of this site to reproduce anything critical of me or my activities which comes to my notice. I believe there are also international conventions dealing with suggestions that babies should be killed and other children should be encouraged to commit suicide. I would like to publicly thank all those people who sent me nice emails throughout last week. I will send individual replies, but things are still a bit disorganised and distraught around my place. It is really nice to know that I have so many friends that I have never met. When I was talking about Ayaan Hirsi Ali last week I forgot to include the film which resulted in the murder of Theo van Gogh. I don't think that it is a particularly well-made or convincing film, but as was seen with the idiocy surrounding some cartoons last year it doesn't seem to take much to get people who are besotted with religion to completely lose touch with reality. Tim is appearing in Sydney over the next two weeks at the Sydney Opera House. It's not too late to book. Have a look at the Aussie Bible. No, Australians do not talk like that.